The John Deere Classic is steeped in history, and it's not all related to golf. In 2013, Jordan Spieth made his mark on golf history at TPC Deere Run. The 19-year-old became the youngest player to win a PGA tournament in more than 80 years when he triumphed in a playoff at the Silvis, Ill., golf course. 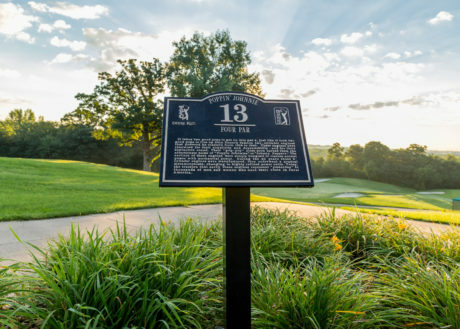 While that achievement may have changed Spieth’s life, it’s one of many important milestones for a piece of land shaped by history. 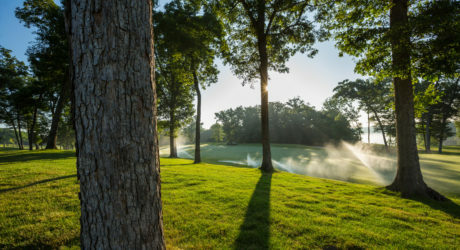 Each hole of the course has a unique story, rooted in the history of John Deere – descendants of the company’s founder owned the land for years – and the surrounding community. 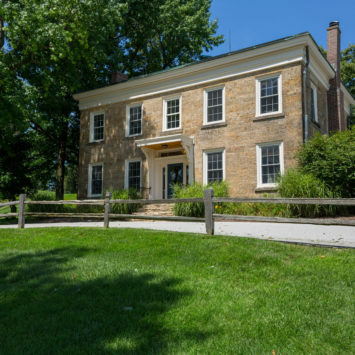 Records for the land that is now TPC Deere Run date back to 1835, when Erskine Wilson purchased a parcel of land near the Rock River from the U.S. government. Wilson and his family farmed there for decades. Poppin' Johnnie, also known as the 13th hole at TPC Deere Run, earned its name because it takes two good pops to get on the green on this par 4. 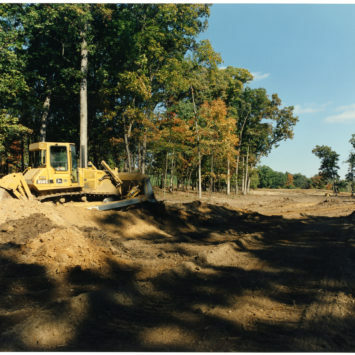 In 1911, the Wilsons sold a parcel of the land to Katherine Butterworth, John Deere’s granddaughter. Butterworth, and other Deere family members, added to their holding along the Rock River, and acquired nearly 400 acres there by 1960. 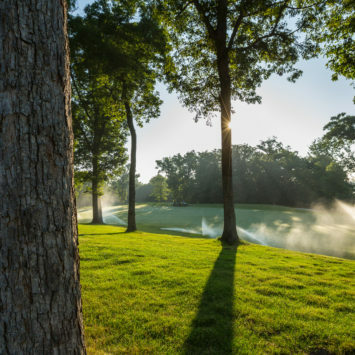 The land encompassed Friendship Farm, a premiere Arabian horse operation, which later became TPC Deere Run. The area has such a rich history that according to Peterson, weaving it into the course design was a must. 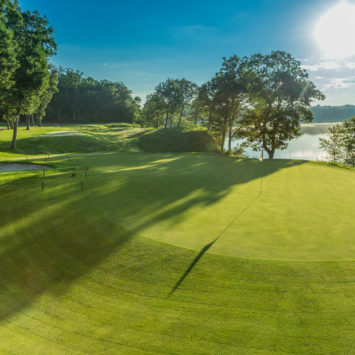 Now, golfers can tackle challenges like “Lincoln’s Crossing” (5th hole), “Mother Earth” (16th hole), or “Conquistador” (18th hole) at TPC Deere Run. Several mature trees line the perimeter of this fairway at TPC Deere Run. Before the American Civil War, a young lawyer named Abraham Lincoln, found himself in a battle between the railroad and steamboat industries. In 1856, engineers completed the first rail bridge over the Mississippi River, linking Davenport, Iowa, and Arsenal Island, home to the Rock Island Arsenal military installation. Two weeks later, the steamboat Effie Afton crashed into a pier, setting both the bridge and boat ablaze. In the ensuing legal fight, Lincoln represented the railroads, which ultimately won. The case cleared the way for further rail bridge construction as America pushed west. 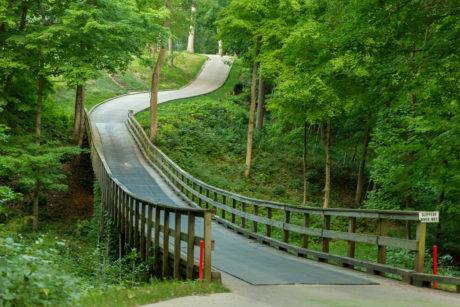 One of the landmarks of Deere Run is "Lincoln’s Crossing" that joins the fifth and sixth holes. Today, the 429-yard par-4 fifth hole at TPC Deere Run is called “Lincoln’s Crossing”. A bridge connects its green with the sixth tee, commemorating the first rail crossing over the Mississippi, and its connection to a future president. About 80 miles northeast of Moline, the town of Grand Detour, Ill., rests on a bend of the Rock River. French explorers named the settlement after the meandering curve of the waterway. It was there in 1837 that John Deere fashioned his polished-steel plow, which would help farmers overcome the problems posed by the rich, sticky Midwestern soil. 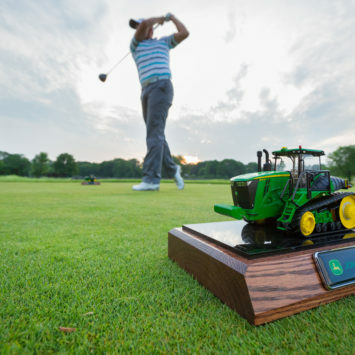 The innovation launched Deere & Company and is immortalized in the first hole of the course. 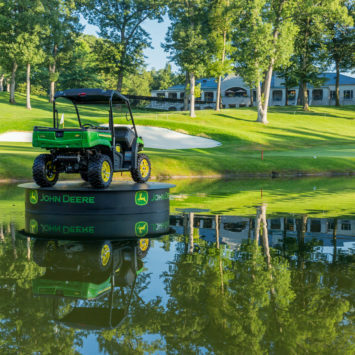 During the tournament equipment replicas double as tee markers at TPC Deere Run. 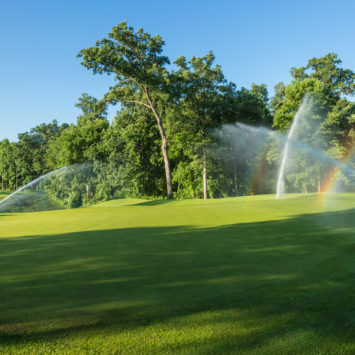 One of the fairways receives a cool drink of water prior to the first round of the day. Early morning dew covers the fairway leading up to this green at TPC Deere Run. Poppin' Johnnie, also known as the 13th hole at TPC Deere Run as it takes two good pops to get on the green on this par 4. 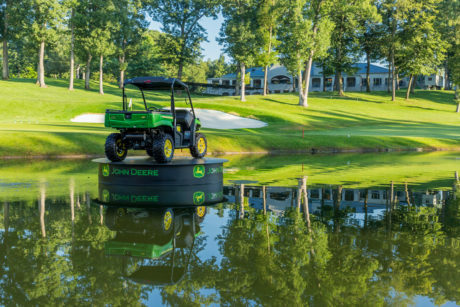 This John Deere Gator overlooks part of the 18th fairway, also known as Conquistador. The 16th hole or "Mother Earth", stretches alongside the Rock River. 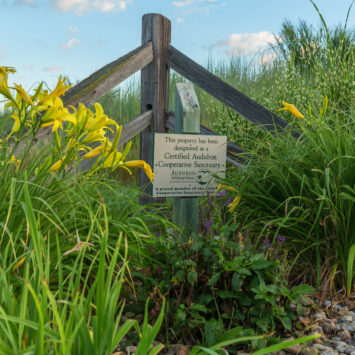 Parts of the course are designated as Certified Audubon Cooperative Sanctuaries. 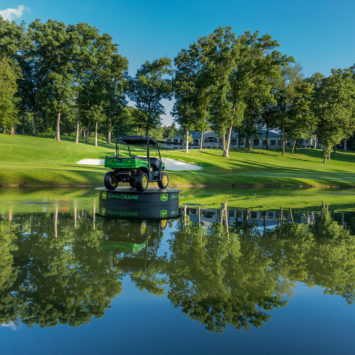 This John Deere Gator overlooks part of the 18th fairway, also known as "Conquistador". Several mature trees mark the edge of this fairway. Erskine Wilson settled on this property in 1838. Stone for the 10-room house was ferried from a quarry a half-mile upriver. Today, the Stone House is the headquarters for tournament staff and sits between Holes 2 and 3. This short par 3 sits on a bluff 40 feet above the Rock River. It’s guarded in front by a deep ravine and to the right by a large bunker. To the left is the Rock River. 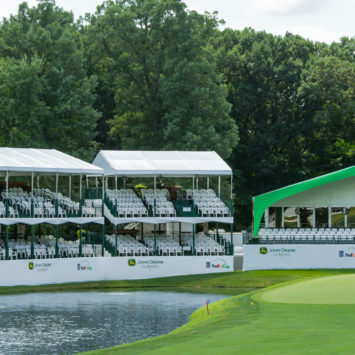 A look at the 18th green at TPC Deere Run, just days before the John Deere Classic takes place. One of the eighteen holes that can be found on TPC Deere Run. 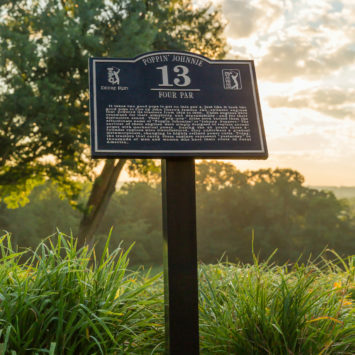 The 153-yard par-3 sixteenth hole, “Mother Earth,” pays tribute to the Native Americans who once lived on the land that is now the course. Archaeologists say tribes settled the region as early as 5,000 years ago. Most recently, the Meskwaki used the land for athletic competitions, including lacrosse in the summer and other games in the winter. Course officials consulted with their descendants who named the hole and gave their blessing to the project. 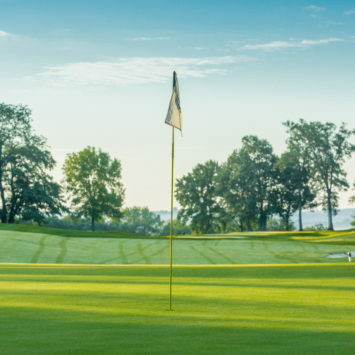 “Games used to be held on this property and having a PGA Tour event with a game as part of its annual presentation made a lot of sense to them,” said Peterson. Nowhere, however, is the history of competition ingrained more deeply than “Conquistador,” the 463-yard par-4 eighteenth hole. 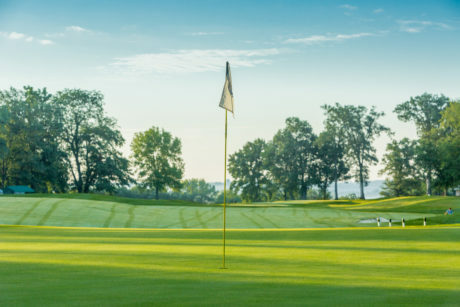 According to Peterson, Friendship Farm bred some of the finest Arabian horses in the world and its foaling barn once sat on the ridge that overlooks the right side of this fairway. One of the farm’s most prized breeding horses was named Llano Grande Conquistador. His champion offspring are recognized around the globe. Many such foals took their first steps on this ground, the same ground that future golf greats would trod on their quests to win the title of champion, just like the famed Arabian horse, Conquistador. 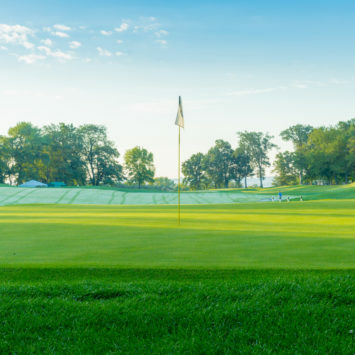 From the design of the TPC Deere Run in the late 1990s to planning and hosting the annual golf tournament every year, John Deere, the community, and the PGA have worked together, said Peterson. 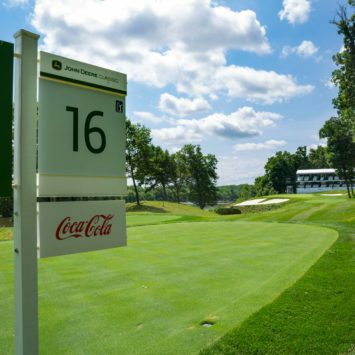 “Having a world-class venue like TPC Deere Run and having a title sponsor like John Deere has cemented that relationship to the point where we’re now the fourth longest title sponsorship on the PGA Tour out of 47 events,” he said. “So it’s a continuing story of community support, John Deere support, and an amazing course to host the event,” said Peterson.